• Winning 1,000 Games The Hard Way: Over 80% of Scott Berry’s games have been on the road with a gauntlet of wild weather conditions. 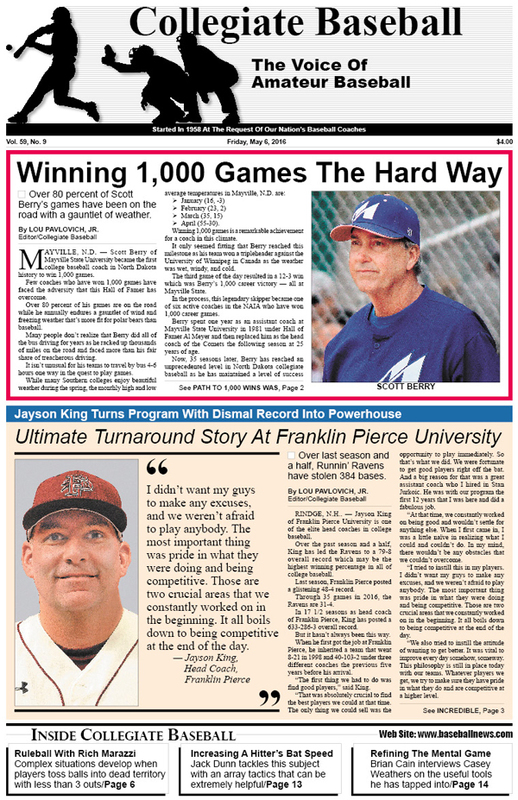 • Ultimate Turnaround Story: Jayson King turns Franklin Pierce into a powerhouse from a struggling program. • Editorial: Abusing pitchers may result in court cases. • Lou Pavlovich Column: TCU sets the bar for great hustle in game of baseball. • Ruleball With Rich Marazzi: Dead ball plays can cause havoc during games. • Charlie Greene: Scoring on pop flies takes place in a variety of ways. • Incredible Game: Illinois beats Ohio State, 1-0 in the 15th innings. • NCAA Div. 2 Notes: St. Edward’s pitcher Eric Hester throws 47-pitch, 7-inning complete game. • National HS Poll: Coppell HS (TX) rolls with 25-1 record to rank No. 1. • High School Notes: Sonoma Academy posts 5 consecutive no-hitters. • NCAA Div. 1 Poll: Florida Gators No. 1 with 36-6 record. • NCAA Div. 1 Notes: Georgia produces unusual hitting streak with 20 consecutive solo home runs. • Baseball Technology: Advanced data has forever changed game of baseball. • NAIA Notes: Tyler Thornton of Tennessee Wesleyan fires two no-hitters one week apart. • NCAA Div. 3 Notes: Brandon Wessels of Buena Vista becomes third player in school history to record 200 hits. • Jack Dunn: Increasing bat speed can be accomplished in many different ways. • Junior College Notes: Duo of pitchers fire no-hitters, including Devin Smeltzer of San Jacinto North (TX) and Joey Knapp of Kalamazoo Valley (MI). • Brian Cain: Value of the mental game is crucial to development of former Vanderbilt pitcher Casey Weathers. To purchase the May 6, 2016 edition of Collegiate Baseball or subscribe, CLICK HERE.